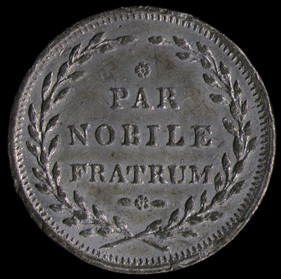 Reverse: STRUCK / & DISTRIBUTED IN / CIVIC PROCESSION / FEBRY. 22ND. 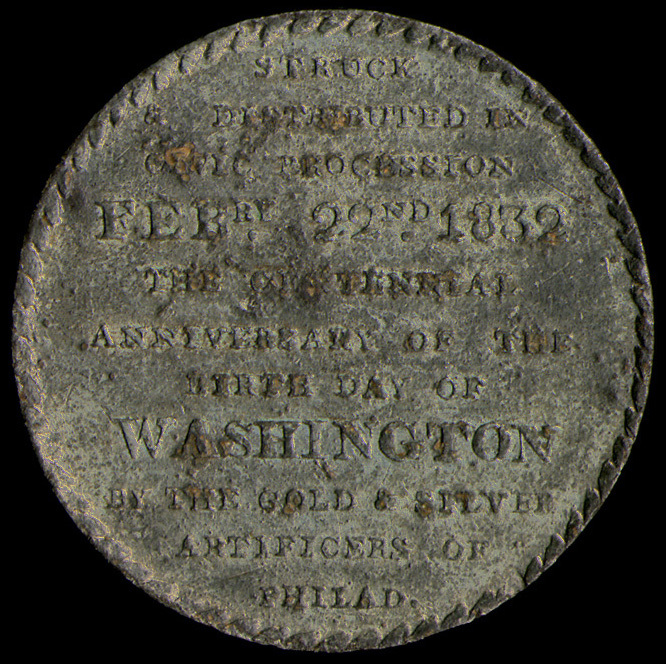 1832 / THE CENTENNIAL / ANNIVERSARY OF THE / BIRTH DAY OF / WASHINGTON / BY THE GOLD & SILVER / ARTIFICERS OF / PHILAD. Comments: This medal was made in Philadelphia for distribution during a procession in honor of the centennial of Washington's birth held on February 22, 1832. 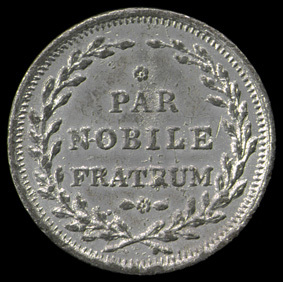 A few silver examples were produced for distribution to officials at the event (less than ten survive) while the remainder were made in white metal (with less than 100 surviving). The medals were issued with a ring in which the item could be placed and then worn as a pin or suspended with a ribbon or string. Copper restrikes of the medal were issued in 1858. Additional restrikes in silver, copper , bronze and white metal were issued through the mid 1880's. The 1858 restrikes were perfect copies but can be distinguised from the originals as they were made of copper. The later restrikes are easily distinguised from the originals as they all show major die cracks on the reverse. The restrikes exhibit a distinct V shaped crack starting at the rim near the first & and moving down to the C in CENTENNIAL then returning to the rim just above the W. There is also a major crack under WASHINGTON, running from the rim to the G.
This example is an original 1832 issue in white metal. The obverse shows a bust right portrait with flowing ribbons attached. Above is an eagle with rays of glory emanating from him; he holds the top ribbon loop in his beak and, according to Rulau and Fuld, is carrying the cameo portrait. The Latin on the ribbon translates as "Father of our Country." The reverse carries an eleven line message and has a denticle edge. Reference: Rulau and Fuld, p. 115. Obverse: [in exergue] W & B . Comments: During the American Revolution the Marquis de Lafayette had been one of Washington's most ardent French supporters. In July of 1777 Lafayette came to America, joining the Continental Army as a Major General and fighting in the Battle at Brandywine, Pennsylvania. In 1779 he went back to France and in April of 1780 returned with a 6,000 man expeditionary army. Lafayette was immediately given command of the army of Virginia and soon trapped the British General Cornwallis at Yorktown, leading to his eventual surrender. In 1824-25 Lafayette made a return visit to America where he was enthusiastically greeted by enormous crowds. During this trip several commemorative medals were struck. 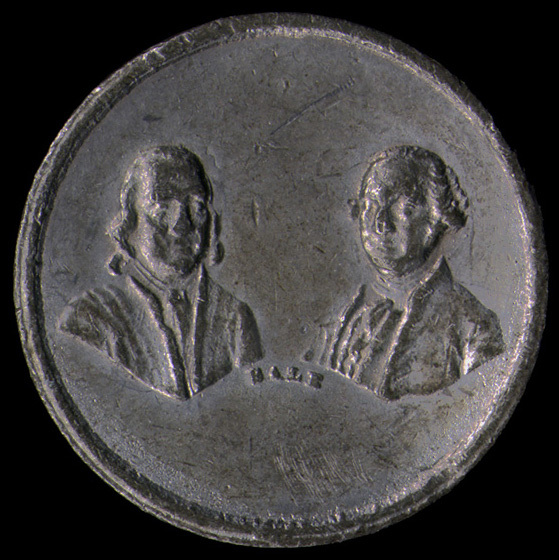 In 1824 Charles Cushing Wright, of the New York City engraving firm of Wright and Bale, produced a small (15mm) medal with Washington on one side and Lafayette on the other (Baker 198) that was issued in gold, silver and white metal versions. The dies were also used to counterstamp various circulating denominations including the large cent, dime, half dollar, one real and two reales coins. Soon thereafter, between 1829 and 1833 C.C. 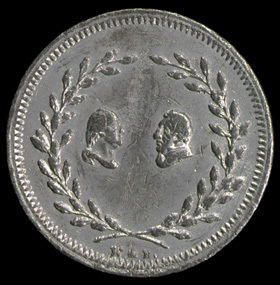 Wright and James Bale produced a commemorative medal with the heads of Washington (left) and Lafayette (right) facing each other, surrounded by a laurel wreath with the initials W & B below for the engravers Wright and Bale. 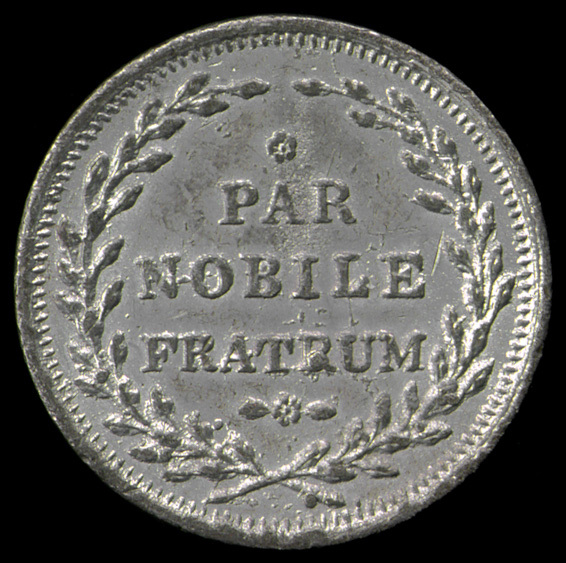 The reverse has the motto PAR NOBILE FRATRUM (equal noble brothers) in a laurel wreath. There is a rosette above the A in PAR and another rosette with a leaf at each side located below and just to the right of the T in FRATRUM. The medal (Baker 197) was issued in silver, copper, nickel and an alloy of silver and white metal. A silver and white metal alloy example of this medal is shown above. In 1834, the year Lafayette died, a large 53mm medal was struck in Paris by a society called the "Cercle Brittanique." The medal portrayed the busts of Washington, with the Polish patriot of the American Revolution, Thadeus Kosciusko and Lafayette (Baker 196). 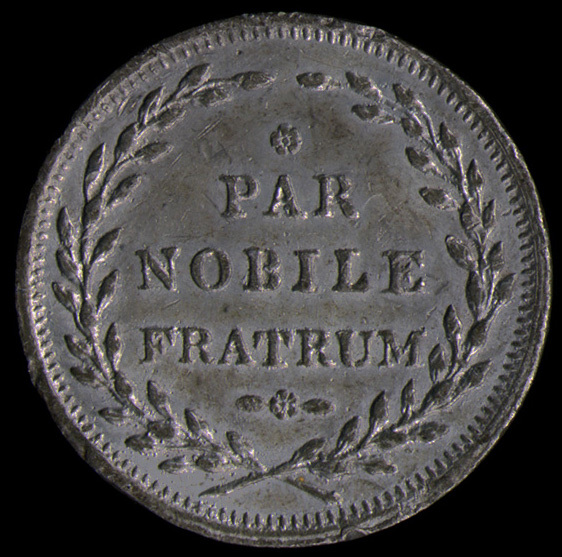 The medal was designed and signed by the French engraver Rogat and issued in bronze and white metal, with later restrikes produced in copper and bronze. Reference: Rulau and Fuld, p. 86. 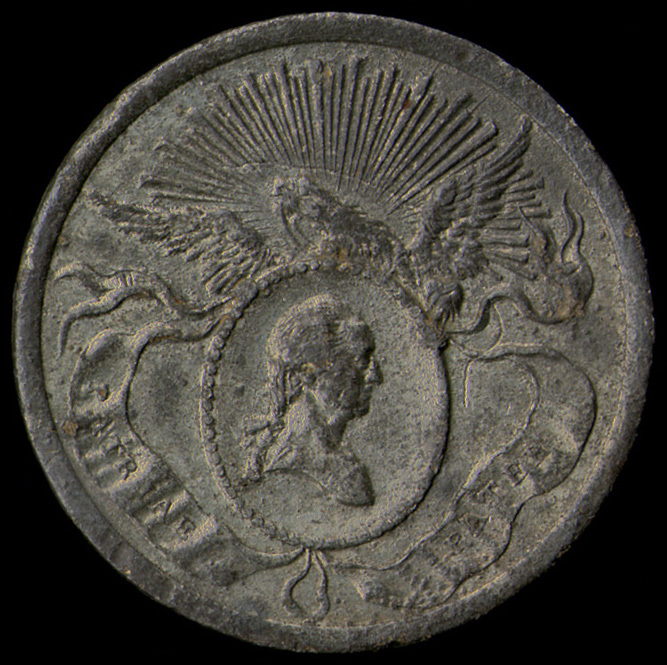 Comments: At the same time the Washington - Lafayette medal (Baker 197) was being minted, that is about 1829-1834, James Bale produced another medal joining the obverse of Baker 197 (Washington and Lafayette) with a reverse showing a three quarter face bust of Benjamin Franklin (left) and Washington (right) facing each other (Baker 203), which was issued in copper, brass and white metal. From about 1834-39 Bale struck another variety combining the Washington - Franklin reverse of Baker 203, but using it as the obverse and joining it with the PAR NOBILE FRATRUM (equal noble brothers) reverse, as on the previous Washington - Lafayette example (see Baker 197). This medal was issued in silver, copper and white metal, with a white metal example displayed above. At the same time Bale also began issuing a medal with the bust of Washington on one side and Franklin on the other. This third medal, Baker 201, was issued in silver, copper, bronze and white metal through about 1848. Reference: Rulau and Fuld, p. 87.